Jazmin and Kirsty, August 2018 - Learning and Playing in Flying Tree! Andrew: Hi Kirsty and Jazmin - thank you so much for speaking with us about your experiences on the Internship Program! What have you particularly enjoyed about the course? Kirsty: I loved how varied the course was and the way in which you adapted it to our needs and interests. Jazmin: Yes, and the teaching experience has been really valuable. I was thinking about the expectations I had and the way that the internships program was marketed - I feel it very much meets expectations and excedes them. I feel like I’ve got everything I wanted out of it and more. Kirsty: I also really loved the teaching experience - I had never really taught before in a studio, and I was very much aware that people were paying to be there in my classes. There was a certain level of expectation you want to meet, and it was nice to feel by the end of the course a sense of confidence that I can really do this! Jazmin: I felt really well supported in the teaching practice and it was so nice to have people come back to the class regularly and to get to know them. Towards the end of the program one of the students came up and said “You’re leaving - I’m so sad!” and so it was nice to feel a part of something. It’s also a great space to practice and play - to see how a studio works, what kind of classes you want to teach and what suits you. Kirsty: The community aspect was great - I remember one of the students passing me photos of us all in matching Medellín shirts in one of the local cafés! 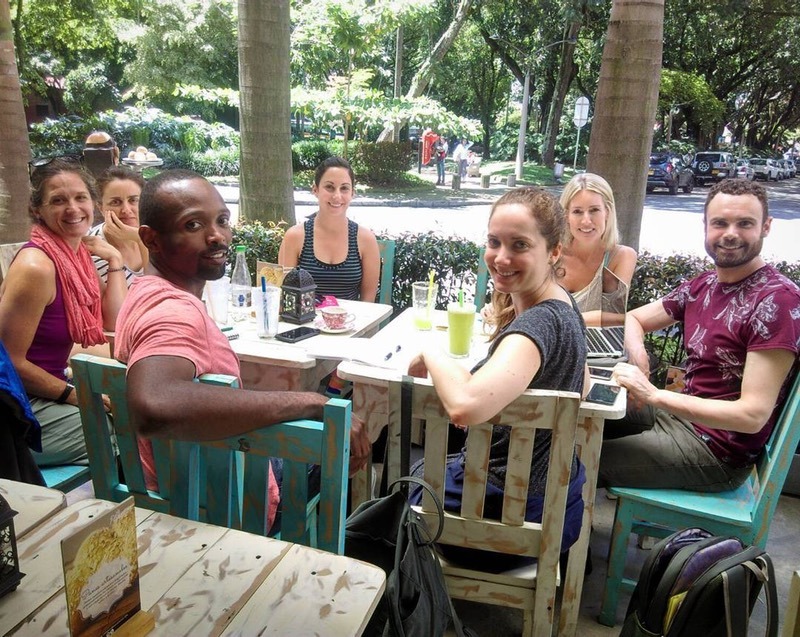 It was nice to be able to be friendly with and talk to people outside the studio and get involved with others in all the different activities going on around Medellín; it was not just about Yoga and teaching. Jazmin: It was great to recognise people out and about in the city. We went for a dance in the Flower Festival and saw one of the girls from my class calling out to us from the stands. So yes, there was a real sense of community - that was in the first week! Kirsty: I think it’s important to recognise that the community really gave us a chance - people were so supportive to us, turning up regularly and watching our little journey. You could tell they were getting more comfortable with us and asking more questions. Andrew: That’s good to hear! And how did you find the Spanish language course? Jazmin: I thought the language course was really well thought-out - people from all levels were getting something from it and so no matter where you were you would be learning something new. I think that if I were to want to tomorrow, I would be able to teach a class in Spanish. Kirsty: I came in as a total beginner, and so the Spanish was a little overwhelming at times, but the teachers’ patience and explanations really helped. Even though I was a bit further behind in terms of pronunciation and understanding, I felt that you let me take my time and ask further questions and I felt really supported. I think that the notes that you gave us and that I took during the course were very solid and will allow me to continue practicing. I wanted to get my pronunciation down a little bit more - and not be scared to speak - and being able to guide a meditation in Spanish at the end of the course felt like a big achievement for me! Ive got all the foundations and now it’s up to me to keep practicing. Andrew: How about the workshops, such as adjustments and assists? Kirsty: I really enjoyed the workshops and how you tailored them to us - themes that we had not really gone into in our teacher trainings. Being able to understand each others’ bodies and how we are so physically different was really useful, and helped us learn how to give adjustments without risking injury. Jazmin: The adjustments that you taught us were very valuable and we had a chance to and practice them both on each other and in the public Yoga classes. Having a senior teacher in class was useful because we could practice our assists and then receive feedback. Kirsty: I really enjoyed the posture workshops and all the little drills we learned. Even just being able to be in the studio on our own during our free time and - I think “play” is a really great word to describe it - playing with ideas and ways of getting into postures and building our own strength was really cool. I’m definitely taking away lots from those sessions! Andrew: How did you find Medellín and the surrounding countryside? Kirsty: I really liked it and I enjoyed the opportunity to go out to some of the local villages on the weekend. The way you organise the schedule so we can choose when we want to teach was great. You can get some balance if you want it and get away from the city. I love how every suburb of Medellín is totally different- as if you are walking into a different country. I’ll miss the fruit man! Jazmin: I think Medellín is an incredibly friendly city and that people here really make it - they are so accepting. It’s quite stunning as well - the mountains are beautiful. If you take the time to engage with the locals you’ll definitely get friendly vibes! Andrew: Jazmin and Kirsty, than you very much! Cheryl's story, February 2018 - Community And Friendship In Medellín! Hi Cheryl - thanks so much for agreeing to be interviewed! Tell me, what drew you to the internship program at Flying Tree? Hi Andrew! Well, I was interested to see if the internship would show me if Yoga was a career I wanted to follow. I wanted to know more about yoga since I had just come out of my teacher training. And of course curiosity about Colombia- that was a big draw for me - I wanted to know more about Medellín. Of course I wanted to learn some more Spanish - but that was more of a bonus for me. It was the experience - I am all for experiences! So I knew it would be fabulous before I got here! Hopefully it lived up to your expectations! Yes of course! So to summarise my intention, it was to see if i wanted to become a yoga teacher, what style I would prefer to teach and also to become part of the community. Was the language course suitable for your level? Yes, so I was a beginner, basic - I knew “hola” and “gracias”. The language program is catered to lots of different levels - it’s amazing what you learn in 2 weeks. And some of the interns were teaching public classes by the end of the course. I learned so much, but I now need to practice more! My goal wasn’t to teach in Spanish but from what I learned - that part of the course could not have been better! It was quite easy to pick up - many of the Spanish words are similar to the English words. Because of repeating the vocabulary so much and attending public asana classes in Spanish, I could understand a lot of what was being said. Even though my speaking level is still low, I can understand what’s happening in class; if I’m travelling around South America I can attend yoga classes in Spanish, which is great. The course was fun and really different. How did you feel about our native speaking teachers? They are wonderful - lovely - and they are also friends. You get to know them - they are really chatty! What did you enjoy about Flying Tree? First of all, it has a lovely vibe about it - it is very relaxed and welcoming. Of course it’s great to experience all the different teaching styles - but for me it was more about getting to know the local community because you see many of the same faces again and again. You will make lovely friendships with the other interns, you’ll take day trips to places like Guatapé, go paragliding - it’s fun and you get to see the country side. There’s so much more to this program than the yoga! Yes - I had assumed that everyone who was there would be straight out of their teacher training, but everyone had very different levels of experience. When I arrived I saw that some were quite fluent in Spanish and were more experienced yoga teachers. But then I realised everyone was so different - they have different goals for the future, different styles of teaching - but it doesn’t matter! I would say to anyone taking this internship - you focus on your own journey and your own goals. I absolutely loved this course. I was extremely lucky to have an amazing group to collaborate with. The full-time teachers were so kind and encouraging. It was a lot more work than I expected, especially learning and remembering the Spanish language. But rewarding and empowering, when I finally lead the beginning sequence in Spanish. It's fun to hear new music, lean new meditations and play around with poses I don't use a lot with people who love yoga. The sense of community and unity is so motivating at Flying Tree. This course was exactly what I needed in order to gain more confidence as a new teacher. Having experienced teachers available to discuss yours ideas with and a feedback session with those same teachers and other interns allowed for a seamless loop between creation, execution, evaluation, repeat. And the group dynamic was the icing on the cake. Everyone was so supportive and encouraging of one another. Being in that environment allowed me to be comfortable both in the studio and outside exploring the beautiful city around us. I received my certification in August of 2016, had no idea where I was headed to next. Leaving the teacher program left me a little lost and insecure about teaching as I felt I hadn't practiced enough teaching. I was trying to find something where I can grow into my own and this program did just that. Leaving this program i felt confident in myself as a teacher and as a student. I learned so much and I value this experience. Honestly, this program shaped me as an instructor and provided the space and support I craved. It allows you to explore in a safe space. I gained a renewed view of what a yoga teacher is; I found my voice as an instructor and the confidence to be able to teach any level anywhere anytime. Grateful for Yoga Internships for making me a fearless teacher! I definitely feel inspired by creative ideas and motivated to use them in various spaces and communities, including schools, community centers, and in my work as a therapist. I gained confidence in teaching meditation and providing a safe practice. I feel comfortable holding and carrying the energy of students and observing where tension is held in the body in various postures. My experience at Flying Tree Yoga allowed me to develop confidence in my personal teaching style. With feedback from my peers and class mates, I grew into myself and developed a greater understanding of my own body awareness. I felt supported, validated, and inspired by other creative minds involved in health and wellness. Since leaving Medellin, I have never felt more in love with dancing Salsa and have a deeper connection to the history and culture of what it means to be Latina! "I decided to join the program to improve my Spanish for my work - I really wanted to improve my language skills. As a yoga teacher, my words are very important and I wanted a program that could help me develop my teaching in Spanish. I was also interested in gaining more yoga teaching experience in another part of Latin America." "It is a very unique program. I don’t know of any other program of its kind that specifically was able to help me work with a few of my challenges as an American yoga teacher in a Spanish speaking country"
What was it like to be part of our community? "I was impressed by the diversity in the community at Flying Tree Yoga. My fellow classmates came from various parts of the world and had a lot of experience in different aspects of yoga: ayurveda, organic farming, work trade experiences around the world and different lineages of yoga. I was also grateful to have the chance to connect and meet so many interesting yoga students, as well." "The yoga community is very friendly in Medellin. I was able to sit down and share meals with a few of my yoga students to really get to know them. I also look forward to seeing a few of the people from the Flying Tree community here in Guatemala." How did you like the city of Medellín? "I fell in love with Medellin. The tall and modern architecture set back with the mountains is lovely. It is considered a very progressive and modern city. I especially liked the artistic and creativity aspects of the city. I spent many afternoons at the Modern Art Museum reading books, sipping coffees and people watching. In Laureles, I met a lot of local artists, designers, and entrepreneurs in clothing boutiques, stationary stores, and the co-ops. This recent resurgence of the creative class in an aesthetically beautiful city brings a lot of energy and inspiration to me as an artist and as a yogi." "I enjoyed the supportive space and feedback that I was given by my fellow classmates and trainers Sierra and Andrew. When you are first starting out as a yoga teacher, you need a safe container to experiment and development your own style as an educator. The feedback I was given was always from a place of kindness and patience"
What have you been doing since you finished? "I have continued developing my career as an international yoga and art teacher. 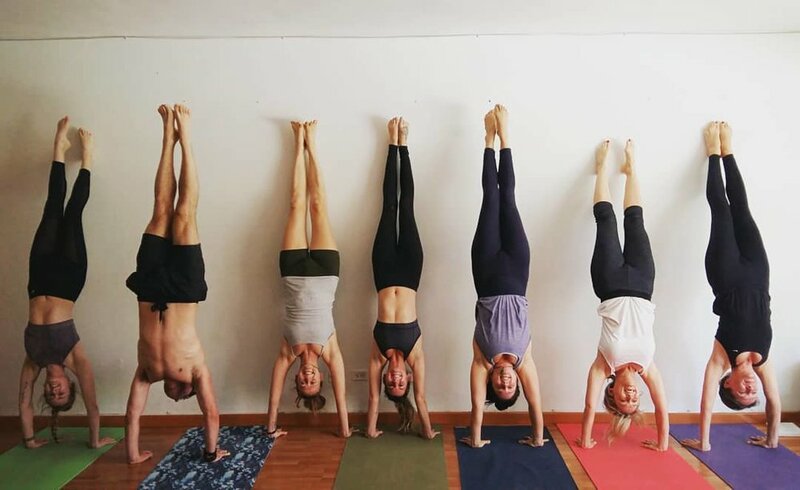 I am teaching and assisting powerful flow classes at Pure Yoga to local Guatemalans, and I teach private classes tothe American expat community in Cayala. Three new things: First, I’ve recently started leading yoga and art classes to children at an inner-city school called Esperanza Juvenil. I have never seen children so eager to learn how to do bakasana “crow pose” before and how focused young people can be with the simple tools of breathing and focus. Children are also very courageous and resilient. So they are not afraid to fall over and get back up and try a new pose over. Second, I have recently started working with a fair trade, organic market called El Mercadito de Lola in Zona 15. They believe in the ethical treatment and promote conscious living for all living beings. I’ve been given the opportunity to teach yoga and art classes and healthy living workshops at their market. It is nice to be able to work with local Guatemalans who want to provide healthy and organic foods and products at a fair wage for their farmers. In turn, I enjoy teaching mindfulness and conscious movement to their community. Third, to stay connected with people who are not in Guatemala, I have launched an online Book Club on Julia Cameron’s “The Artist Way.” It’s a 12 week program that I coach online which helps people develop their creativity and incorporate more creative living in their lives." Did the course help you in any way achieve these things? Yes, I was thankful for the space and support to really development my Spanish, be creative in the various ways I like to teach yoga and art, and to simply have time to be in a different environment than what I have been used to. When I step away, refine and focus, I gain more insights on who I am as a yoga practitioner and as a yoga teacher. I’m grateful for the special opportunity to learn and develop my skills in Medellin. Check out Nicole's wonderful blog and instagram! If you've enjoyed this article and are interested in joining our community for an internship program, why not check out our course! "I had a wonderful internship with Yoga Internships, Colombia. The accommodations were comfortable and spacious with more than everything I needed and I felt very at home. The internship provided a safe space to continue to learn, practice, experiment, get feedback, and grow as a teacher. I loved that it was a collaborative community where everyone’s opinions were valued and that we were invited to share information. I really enjoyed that we could somewhat self-direct what we wanted to focus on so that everyone could fill in the gaps from their training as they needed. Andrew and Sierra are passionate and knowledgeable and everything that was presented was relevant and helpful. Furthermore, I very much welcomed sharing with teachers from different schools of yoga and all of the opportunities for additional learning (Thai massage, kombucha, henna, etc). I greatly appreciated the Spanish for yoga course as I had not seen any similar courses offered. It was one of the primary reasons I did the program and I was not disappointed as I felt comfortable teaching in Spanish after completing the internship. Overall, I had such a valuable experience. I have come away not only a more knowledgeable and aware teacher, but I have made many new friends within the teaching community with whom to continue to share and grow." "I was fortunate to teach at Flying Tree Yoga Studio in the Spring of 2015 and I can’t imagine a better setting in which to have explored this new territory of teaching yoga as a newly-certified teacher. The teachers are incredibly supportive and open paths for new growth, both on the yoga mat and personally. I learned the practical skills of leading classes that you only get with practice – how to sequence, how to cue effectively, how to create space, how to speak from the heart and provide more than just a physical workout. Flying Tree was the perfect setting to grow into an effective and inspired yoga teacher. It was a perfectly blended setting between formal and casual, so I could try-on teaching styles and not feel pressured to be absolutely perfect. This program gave me the opportunity to make mistakes and that is absolutely essential to growth. Living at the studio was a dream. And Medellin life is quite idyllic – strolling through the palm-lined streets with the girls to our favorite café, being greeted with smiles by all the passing Colombians is something I hold dear. I am entirely grateful for my experience at the studio and whole-heartedly recommend it to anyone who wants a beautifully fulfilling experience that expands your capacity to inspire as a yoga teacher." "I took part in the Spanish Yoga Course and I would highly recommend it to anyone who intends on teaching yoga in Spanish. The teachers are friendly, dedicated and highly knowledgeable, which made me feel comfortable within myself to explore new concepts and take risks while teaching classes, with my newly learned Spanish vocabulary. The course is fun, practical and collaborative. Thanks guys!"